Special event Dinner Cruise and Annual Fireworks Competition Show on the M.V. 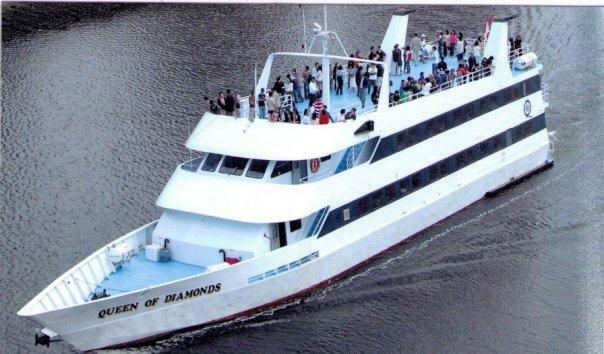 Queen of Diamonds: 4 hour cruising plus 1 hour boarding time. Includes double entree buffet style dinner. Admirals Fleet Dinner Menu: main entrees are Baron of Beef au Jus and BBQ Filet of Salmon. Includes Dessert Buffet that also features our famous Chocolate Fountain, unlimited refills on coffee & Tea. Enjoy dinner, the cruise, a sunset and the annual simulcasted Fireworks show. Fully Licensed Cash Bar available (also accepts Visa, MasterCard Interac, Visa Debit). Online Ticket Ordering accepts Visa, Mastercard, Visa Debit and Discovery card. A map of Plaza of Nations Marina boarding location with parkng info will be included in emailed order confirmation with virtual tickets. NOTES: 1) Under-age passengers permitted when with their parent or legal guardian. 2) Open-air sun-deck seating are refundable if confirmed raining. Option to moving seating inside to retain booking, based on availability. 3) Those who reserved their table inside are guranteed a minimum of standing space on our outside decks if choose to view Fireworks from there. 4) Tickets are non-refundable.